Scrumptious appetizer that will impress dinner party guests but take you just moments to prepare! Wash your grapes and make sure they’re fully dry before beginning recipe. 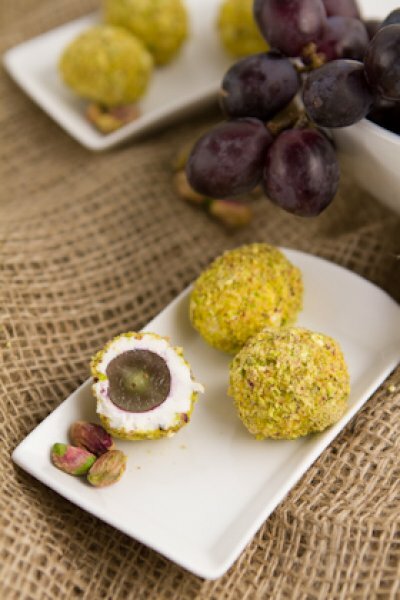 While grapes are drying, grind pistachios in a food processor or coffee grinder. Place 1 teaspoon of soft goat cheese in the palm of your hand. Press the grape into the cheese. Roll the grape between both your hands as you would when forming a meatball. 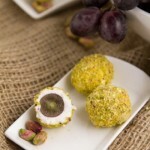 Once the grape is fully covered with goat cheese, roll in ground pistachios. Set on a separate plate and repeat. Recipe can be made a couple of hours beforehand, covered and placed in the fridge until ready to serve.